It was a great experience editing 7 short teasers for this film. The teasers alone clocked in over 41 million views. 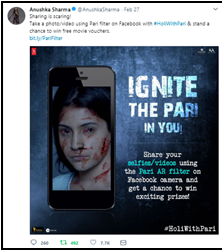 Pari’s scary social media strategy sets a movie marketing example. Pari, one of the most anticipated Bollywood horror films, was scheduled to hit the screens, on March 2 during the festival of Holi. 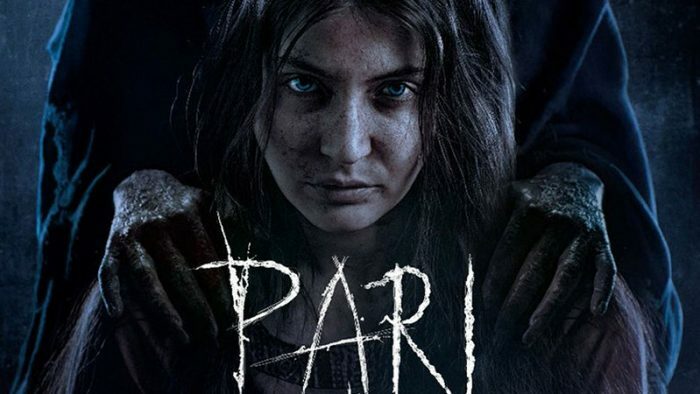 Produced under the banner Clean Slate Films, owned by the leading lady of the film, Anushka Sharma, Pari was marketed through social media in order to generate maximum awareness around its release. Pari was promoted and marketed through social media, leading up to it’s release leveraging timely and regular material from the film such as posters, ‘screamers’ – wordplay on the word ‘teasers’ due to the horror genre and many such activities. The Pari team intended to promote the film as a unique take on the horror genre, and also emphasizing on the release date of the film during the Holi weekend. Communication around the promotional material was pivoted around the message of Pari being ‘Not a usual horror film’. Keeping in mind the genre of the film, Pari was promoted through suspenseful short teasers, termed screamers. These ‘screamers’ were created specifically for the marketing activities on social media such as ‘Growing nails’, ‘I love you too’ and more. Beginnging the social media activity for Pari a couple months before its release, Anushka Sharma rolled out the first screamer for the film, initiating the promotional campaign of the film. The film’s release on the festival of Holi was emphasized with the hashtag #HoliWithPari, then following up with the second screamer exactly one month before the release of the film. The third screamer for the film, ‘I love you’, was rolled out during Valentine’s Day, creating a strange and scary perception around the film, following up with screamer 4 on 19th February, slowly gaining momentum as the film was nearing it’s release date. Exclusive posters and images were posted on social media in order to sustain the momentum. Launching another poster, the Pari team made sure they sustained the conversation and intrigue on social media while at the same time, successfully establishing a memory in the minds of users that the film was releasing on Holi. 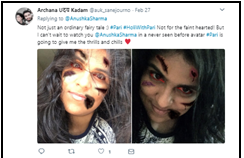 On Twitter, Pari engaged audiences by sending out creepy replies with GIFs from the film through Clean Slate Films and Anushka Sharma’s accounts, surprising the audience and ensuring maximum engagement. Additionally, an automated Messenger bot for the film was leveraged, sending out important information to Messenger users, along with an interesting new AR based Face Filter, urging audiences to share their pictures for a chance to win movie tickets for Pari. 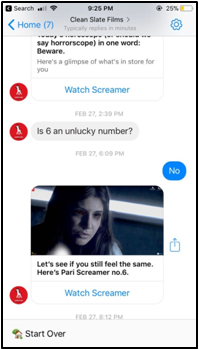 Screamers 5, 6, and 7 were rolled out at different times before the release of the film with the 7th one being posted just one day before the film released in order to create maximum impact. One of the first Bollywood films to use the new Press and Hold Format posts on Facebook, Pari put a scare in social media users by putting up an endearing image as the thumbnail, but revealing a scary image upon interaction. As a part of the offline activities that were amplified digitally, the Pari team conducted a series of pranks at a theatre in Mumbai, promoting them on social media. Countdown posts were rolled out on social media to create recall in the minds of social media users. Post the release of the film, positive reviews were collated and a Twitter Moment was created out of it, also executing a similar activity on Instagram with 9 reviews. The total views received by the 7 screamers posted at regular intervals by the Pari team were clocked at over 41.4 Million. The Pari trailer grossed over 17 Million views, with the overall promotional campaign for the film generating 1.4 Million Impressions on Twitter, with 22941 of engagement and 18955 mentions. On Facebook, Pari received 85 Million Impressions, with 268K Engagement and a Reach of over 78 Million, whereas on Instagram, Pari managed to clock in 1.3 Million Impressions, 90K in Engagement and a Reach of over 1.2 Million.